Caption slip reads: "Photographer: Wesselmann. Date: 1958-01-09. Reporter: Coart. Assignment: Two boys pinned in car at Santa Monica Boulevard & Vine Street. 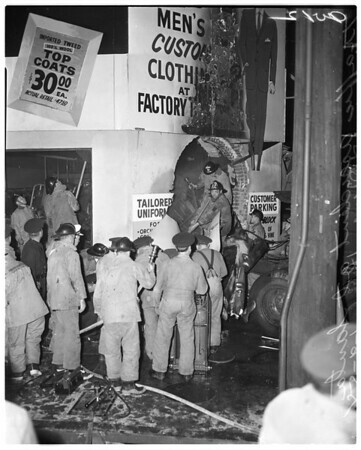 12-16: General view of trailer into building and firemen trying to pry Bob Cairns out of wrecked car. 32: Cairns' companion in car, James Smith, 25, attended by nurse Corrine Cook at Hollywood Receiving Hospital 36-42: Daniel Flores, 40, truck driver, and Mrs. Ann Knapp, 40, who was in cab of truck with him. 3-8-37-38: Different shots of Bob Cairns being pried out of wreckage by firemen at scene (boy's head can be seen with pain on face). 34: Bob Cairns at Hollywood Receiving Hospital in great pain from legs being caught in wreckage of car".